JP's Music Blog: Feel The Heat Of J.D. Wilkes' Debut Album "Fire Dream"
Feel The Heat Of J.D. 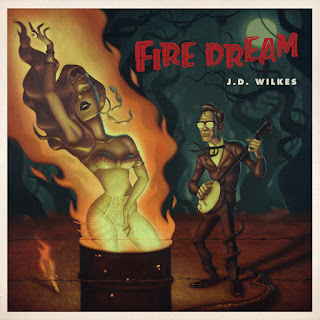 Wilkes' Debut Album "Fire Dream"
Experimental roots/rock artist J.D. Wilkes will released his solo debut album on February 16th, through Fat Possum Records. Wilkes was a member of the Legendary Shack Shakers and also performed along side such fellow artists as Johnny Cash, Merle Haggard and Hank Williams III. His new solo album titled "Fire Dream" features his brand of hillbilly-gypsy music, with the help of members of the Squirrel Nut Zippers, Drive-By Truckers and The Bo-Keys. The new ten track release begins with the Tom Waits-feel of the title song "Fire Dream," as Wilkes's vocals sound as if he is inviting you to the headlining act of a traveling carnival. His music takes on a ska-like groove for "Down In The Hidey Hole" and then swings to the gentle, jazzy sway of "Moonbottle." He picks up the tempo, with the bluegrass stomp of "Wild Bill Jones," then delivers the poetry of "Walk Between The Raindrops." Wilkes wraps up his new album with the old-fashioned country appeal of "Starlings, KY," the story of the "Bible, Candle And A Skull" and piano blues of "That's What They Say." To find out more about J.D. Wilkes and his latest release "Fire Dream," please visit jdwilkes.com.